Comedian Daniel Tosh calls Snowpiercer, the worst movie he's ever seen. I however disagree, as it is both highly original and highly imaginative, but set in a very odd location. When global warming has become too much for the planet, top scientist create a cure, a new chemical that will stabilize the planet, however there is a miscalculation leading to a global ice age, which kills off most of the planet. Earth's remaining inhabitants are left stranded on a single luxury train that is forced to continually circle the earth. I understand that this train was a billionaires dream and has this state of the art engine that will last for decades, but why a train? I'd think if the world was ending, these people would put their money into an underground civilization or some super generator for the worlds largest building, because too me, a train doesn't make a whole lot of sense. When the engine fails, you're dead and if the ice causes a derailment or an avalanche crushes the tracks? There are so many things that could go wrong with this idea, that it's virtually impossible, that for 18 years, nothing has gone wrong. Captain America, Chris Evans stars and he is really terrific. I can't believe I never heard of this guy until a couple of years ago. He leads as if he's been doing it for years and Evans is assisted by a unique cast of characters, one stranger than the next, but their goal is all the same, to leave the crowded, filthy, back of the train, for the luxurious front. Every car brings with it new challenges and they must fight for their lives, before they can even worry about their freedom. The fact that this whole movie takes place on a train is intriguing and makes from some pretty unique scenes. 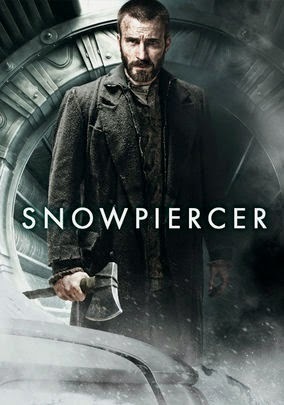 Snowpiercer is one of the most imaginative films to come along in a long time and it features a huge cast of talented actors, that span multiple generations and ethnicities. To even my surprise I really enjoyed the film and couldn't wait to see what lay ahead in the next boxcar, but for as much as I liked the film, a thought kept gnawing in the back of my mind, why a train?